Chicken enchilada recipes require a delicious enchilada sauce. I’m sure you can appreciate that it’s the sauce that makes the dish. So before you even start with our chicken enchilada recipes, I’ve got an enchilada sauce recipe you should make for this. It only takes a few minutes to make. Sometimes we don’t have the time to make everything for dinner so I want to make a suggestion for you that taste pretty good. I don’t know about you but I have not found any great canned enchilada sauce at your local supermarket, until recently. My first recommendation is to buy some enchilada sauce from your favorite Mexican restaurant. I’m sure they would be happy to sell you a quart. My second recommendation is to try Trader Joe’s bottled enchilada sauce. It is really quite good and I think you will be happy with the results. I use it when the kids are screaming for something to eat and I’m too tired to cook. 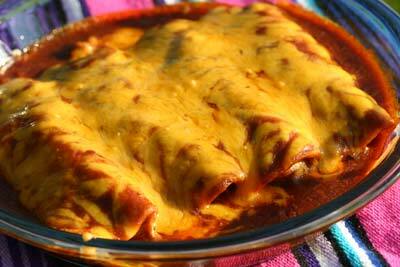 If you would like to try our cheese or beef enchiladas you will find those recipes here. Personally, I think dark meat makes the chicken enchilada recipes better than white meat. The choice is yours. Rinse your chickens in cold water and place them in a pot and fill with water. You are going to boil the chicken for 1/2 hour. Always test your chicken to make sure it is done. You don’t want to see any red juices coming out of the chicken. When done, remove the chicken to a dish to cool off. When the chicken is cool enough to touch, you will debone the chicken. Discard the skin, bones, grisle, and any other parts you don’t want to eat! Try not to leave your chicken out at room temperature too long. You don’t want to encourage bacterial growth. Place your deboned chicken on a clean cutting board and cut the chicken into approximately 1 inch chunks. If you have ever considered buying one good knife for your kitchen, here is one I have been happy with. I use it all the time and love it. It’s razor sharp and lightweight. At this point you can start assembling your chicken enchiladas. If you want to keep your chicken warm just put it in a pot on the stove in the liquid it was cooked in. Heat the vegetable oil on medium high heat in a frying pan big enough to fit the tortillas in. When the oil is hot, take two tortillas with tongs and hold them in the oil until they bubble. The tortillas should bubble right away. If they don’t, your oil is not hot enough. Lift and dip the tortillas in and out of the oil 3 times fairly quickly. The goal is to make the tortillas soft so they are easy to roll. If you leave them in the oil too long,the tortillas get stiff and are hard to roll. Toss those aside and try again. If you make these chicken enchilada recipes enough times, you will get good at it. Now dip the tortillas in hot enchilada sauce to coat them. Transfer the coated tortillas to a plate or tray. The tortillas will be hot, so be careful. You might want to wait 1 minute to let the tortillas cool. Now add a large spoonful of chicken on top of the coated tortilla. Lay it right down the middle from end to end. Grab one end of the tortilla (closest to you) and bring it over 3/4 of the way to the other end. Place your fingers on top near the chicken. Tuck and roll the enchilada over so that the opening is now on the bottom. Pick up the enchilada and place it on a oven-proof dish. When you pick it up, make sure you grab the seam on the bottom with your fore fingers and let your pinky fingers cover the ends of the enchilada so the chicken doesn’t fall out. After a little practice you’ll realize that making these chicken enchilada recipes is a breeze. After you have placed your chicken enchiladas in the dish, use a ladle to spoon the enchilada sauce over the top of all the enchiladas. Spoon plenty of sauce to completely cover the enchiladas and the bottom of the dish. Sprinkle grated mild cheddar cheese over the top of the chicken enchiladas. Use a much or as little as you desire. Then sprinkle finely chopped yellow onions on top or not. Place the enchiladas in the oven. You don’t need to cover them with foil. Since all of your ingredients are warm, you will only need to leave them in the oven a few minutes. When you see that the cheese has completely melted and the sauce is bubbling around the edges, you know it’s hot enough. Take the chicken enchiladas out of the oven and serve immediately. Try our easy chicken enchilada recipe. It will get you out of the kitchen sooner and your family will love it. Would you like to try Mamasita’s chicken enchiladas recipe sumbitted by one our our website viewers? This one is delicious, easy and a great way to use up your left over chicken.